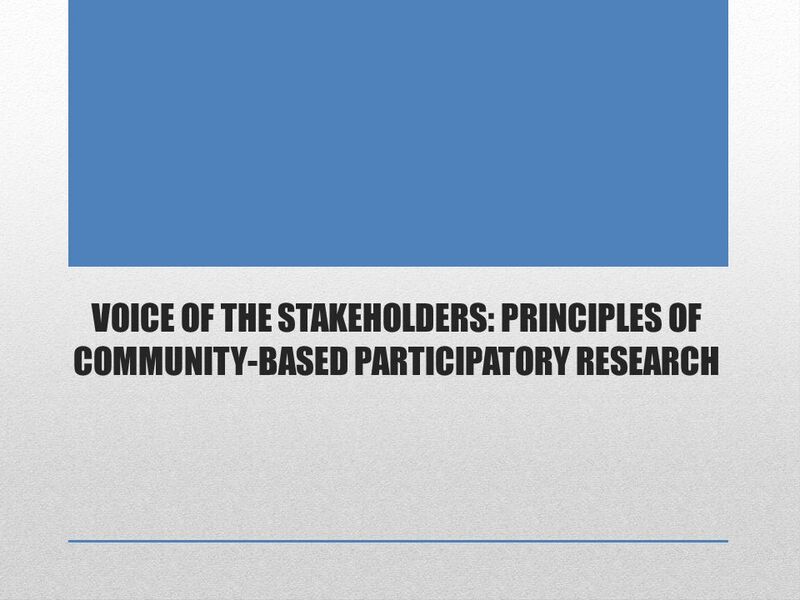 VOICE OF THE STAKEHOLDERS: PRINCIPLES OF COMMUNITY-BASED PARTICIPATORY RESEARCH. 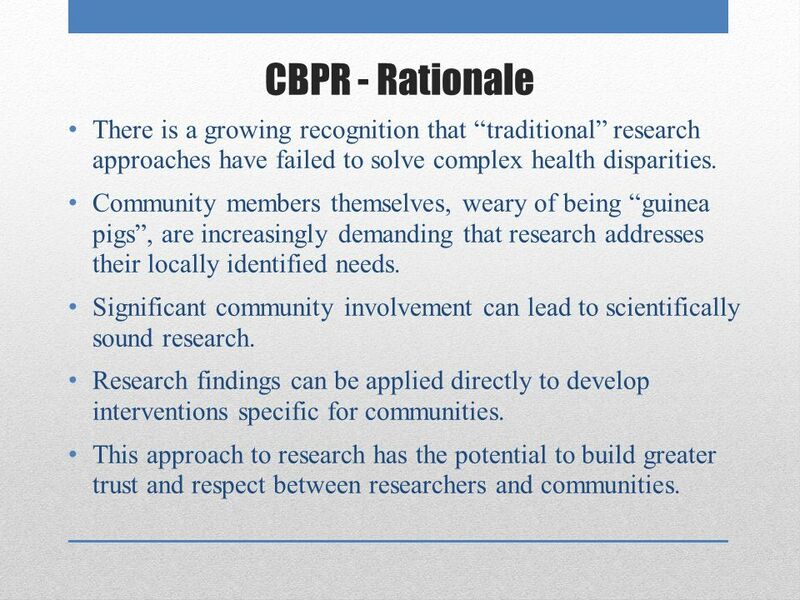 5 CBPR - Rationale There is a growing recognition that “traditional” research approaches have failed to solve complex health disparities. Community members themselves, weary of being “guinea pigs”, are increasingly demanding that research addresses their locally identified needs. 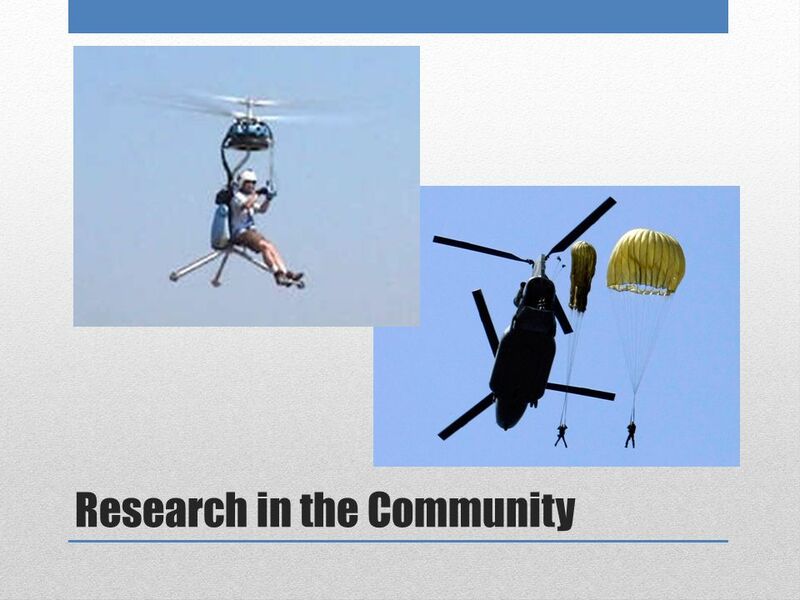 Significant community involvement can lead to scientifically sound research. 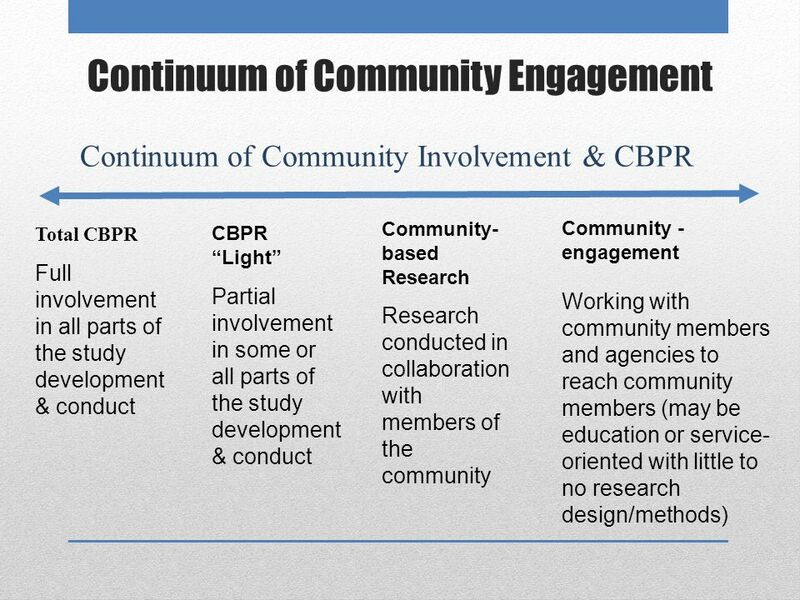 Research findings can be applied directly to develop interventions specific for communities. 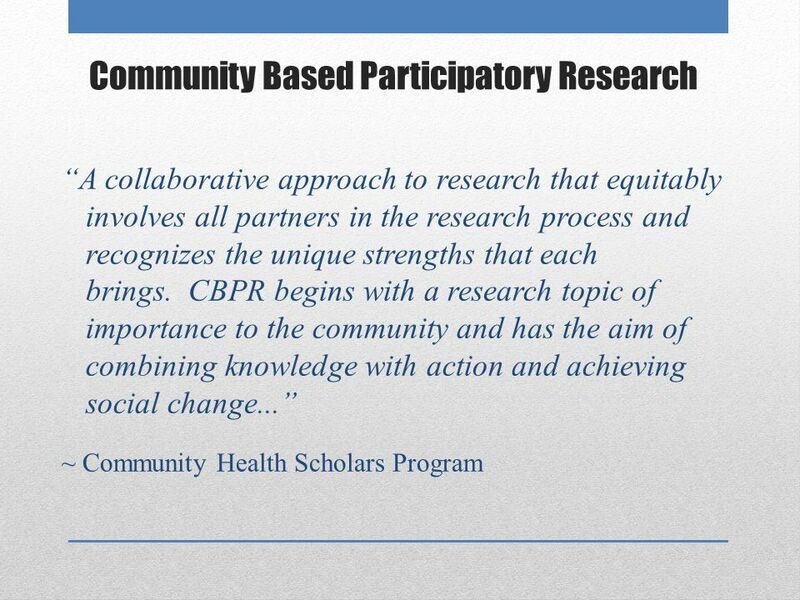 This approach to research has the potential to build greater trust and respect between researchers and communities. 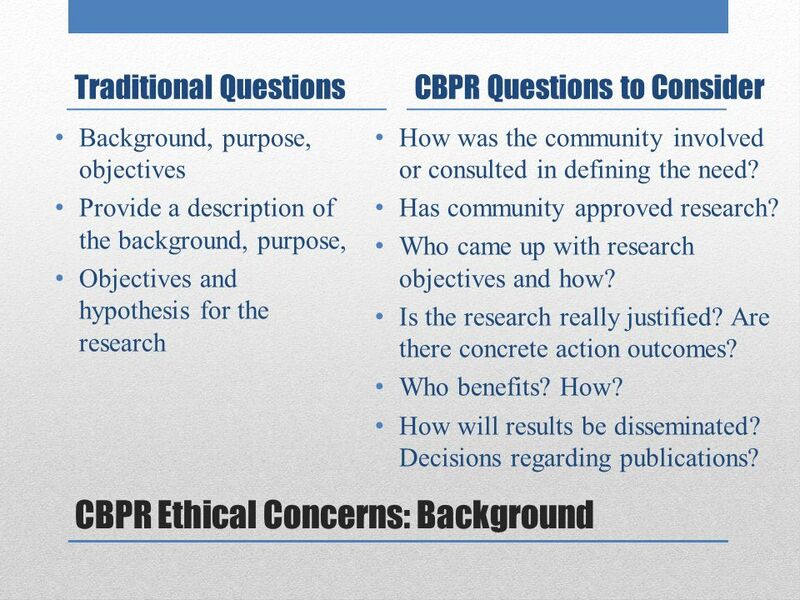 10 CBPR Ethical Concerns: Background Traditional Questions Background, purpose, objectives Provide a description of the background, purpose, Objectives and hypothesis for the research CBPR Questions to Consider How was the community involved or consulted in defining the need? Has community approved research? Who came up with research objectives and how? Is the research really justified? Are there concrete action outcomes? Who benefits? How? How will results be disseminated? Decisions regarding publications? 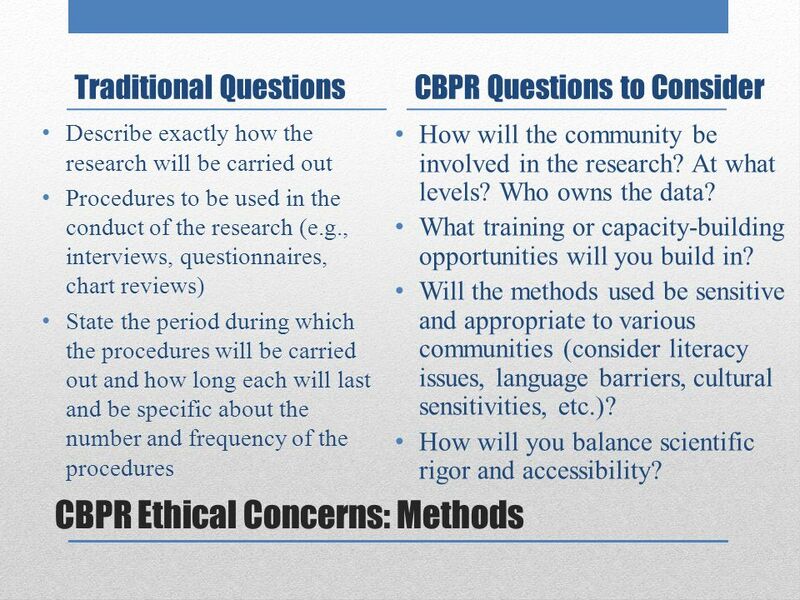 11 CBPR Ethical Concerns: Methods Traditional Questions Describe exactly how the research will be carried out Procedures to be used in the conduct of the research (e.g., interviews, questionnaires, chart reviews) State the period during which the procedures will be carried out and how long each will last and be specific about the number and frequency of the procedures CBPR Questions to Consider How will the community be involved in the research? At what levels? Who owns the data? What training or capacity-building opportunities will you build in? Will the methods used be sensitive and appropriate to various communities (consider literacy issues, language barriers, cultural sensitivities, etc.)? How will you balance scientific rigor and accessibility? 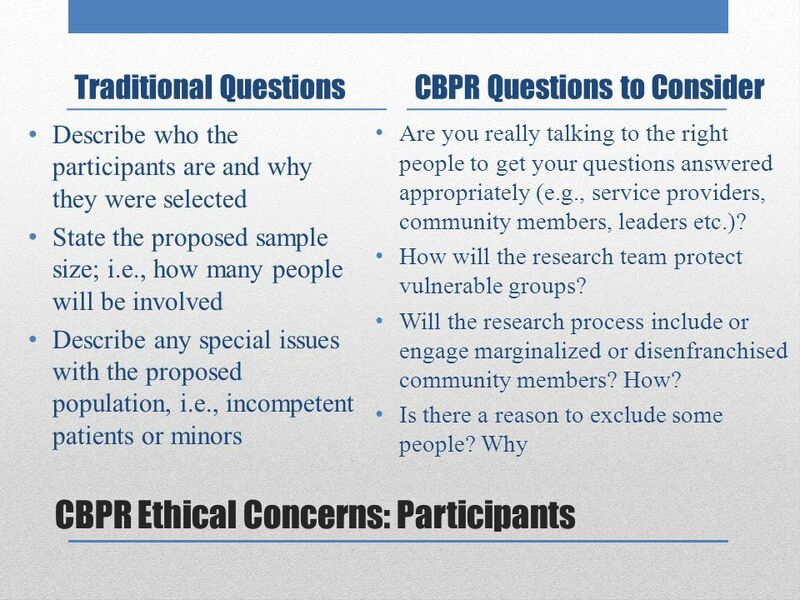 14 CBPR Ethical Concerns: Recruitment Traditional Questions Describe how and by whom participants will be approached and recruited. Include copies of any recruiting materials (e.g., letters, advertisements, flyers, telephone scripts). State where participants will be recruited from (school;, church, etc.) 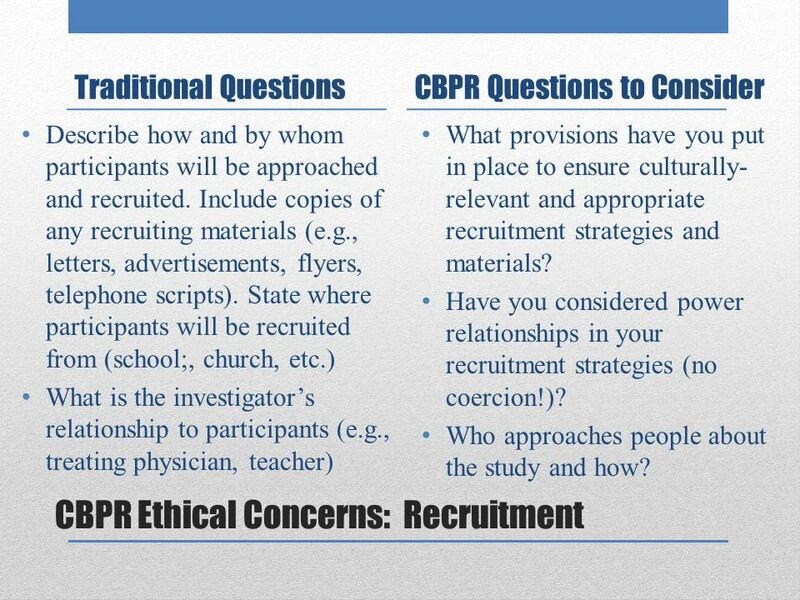 What is the investigator’s relationship to participants (e.g., treating physician, teacher) CBPR Questions to Consider What provisions have you put in place to ensure culturally- relevant and appropriate recruitment strategies and materials? Have you considered power relationships in your recruitment strategies (no coercion!)? Who approaches people about the study and how? 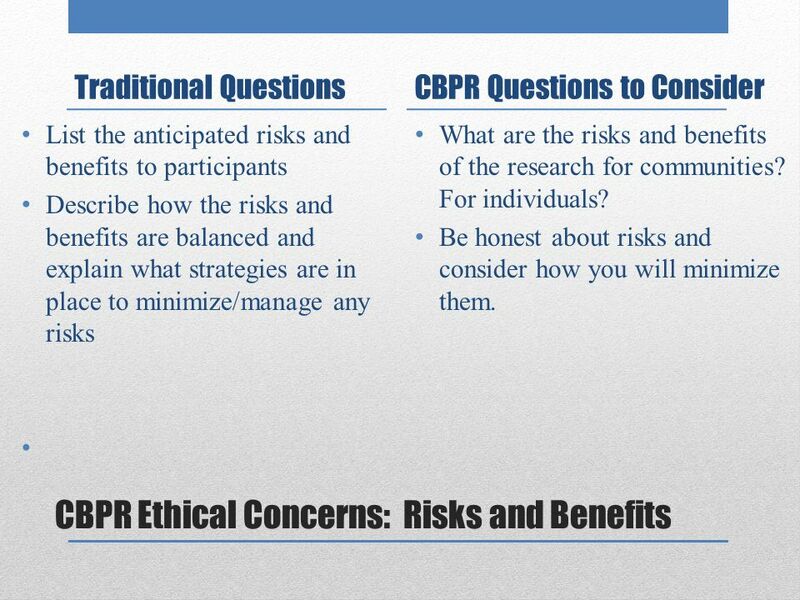 15 CBPR Ethical Concerns: Risks and Benefits Traditional Questions List the anticipated risks and benefits to participants Describe how the risks and benefits are balanced and explain what strategies are in place to minimize/manage any risks CBPR Questions to Consider What are the risks and benefits of the research for communities? For individuals? Be honest about risks and consider how you will minimize them. 16 CBPR Ethical Concerns: Privacy and Confidentiality Traditional Questions Provide a description of how privacy and confidentiality will be protected. 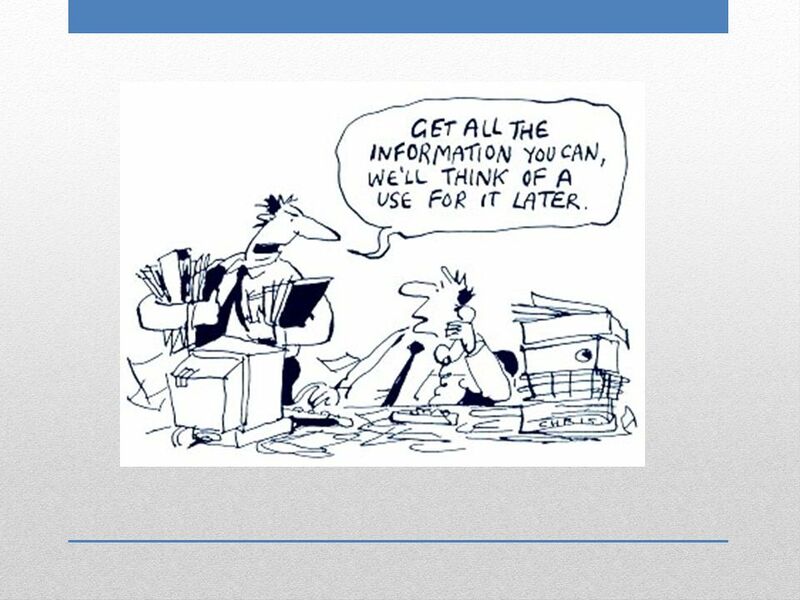 Include a description of data maintenance, storage, release of information, access to information, use of names or codes, and destruction of data at the conclusion of the research; include information on the use of audio or video tapes CBPR Questions to Consider Where will you store data? Who will have access to the data? How? What processes will you put in place to be inclusive about data analysis and yet maintain privacy of participants? Collective privacy? What rules will you have for working with transcripts or surveys with identifying information? How do you maintain boundaries between multiple roles (e.g., researcher, counselor, peer)? 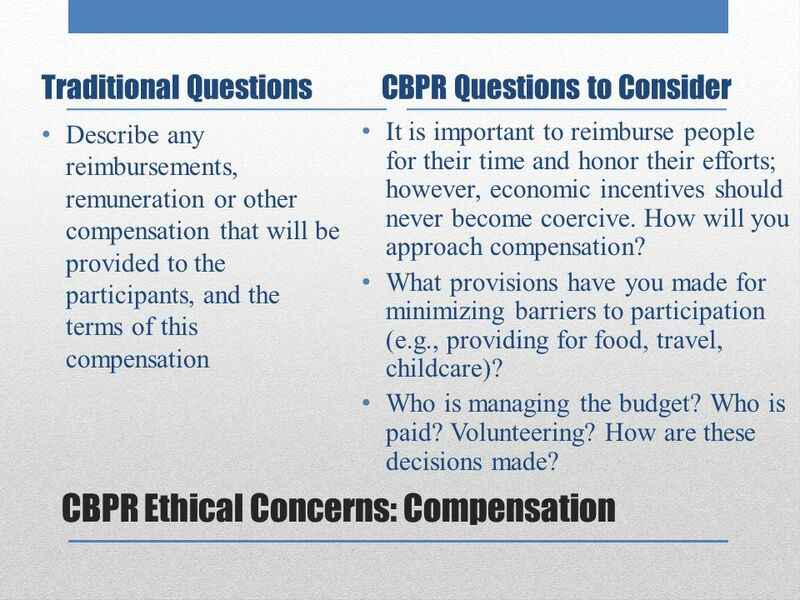 17 CBPR Ethical Concerns: Compensation Traditional Questions Describe any reimbursements, remuneration or other compensation that will be provided to the participants, and the terms of this compensation CBPR Questions to Consider It is important to reimburse people for their time and honor their efforts; however, economic incentives should never become coercive. How will you approach compensation? What provisions have you made for minimizing barriers to participation (e.g., providing for food, travel, childcare)? Who is managing the budget? Who is paid? Volunteering? How are these decisions made? 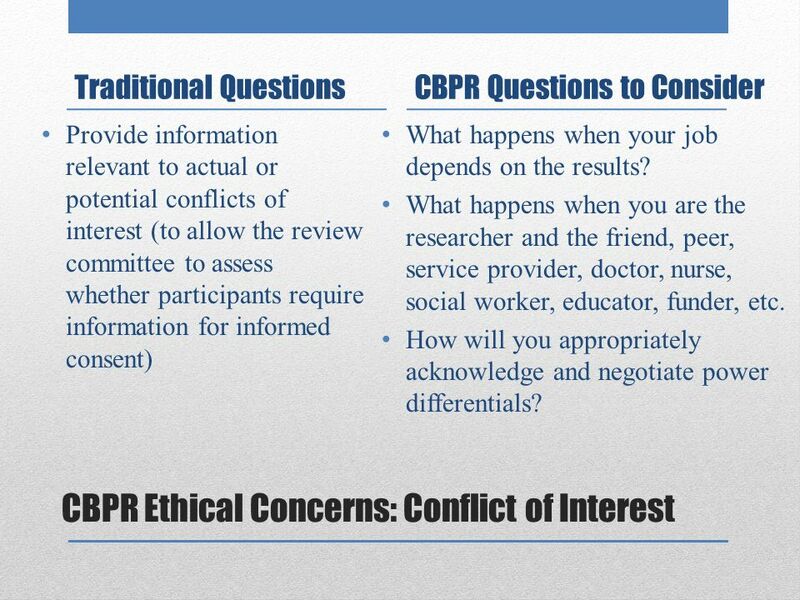 18 CBPR Ethical Concerns: Conflict of Interest Traditional Questions Provide information relevant to actual or potential conflicts of interest (to allow the review committee to assess whether participants require information for informed consent) CBPR Questions to Consider What happens when your job depends on the results? What happens when you are the researcher and the friend, peer, service provider, doctor, nurse, social worker, educator, funder, etc. How will you appropriately acknowledge and negotiate power differentials? 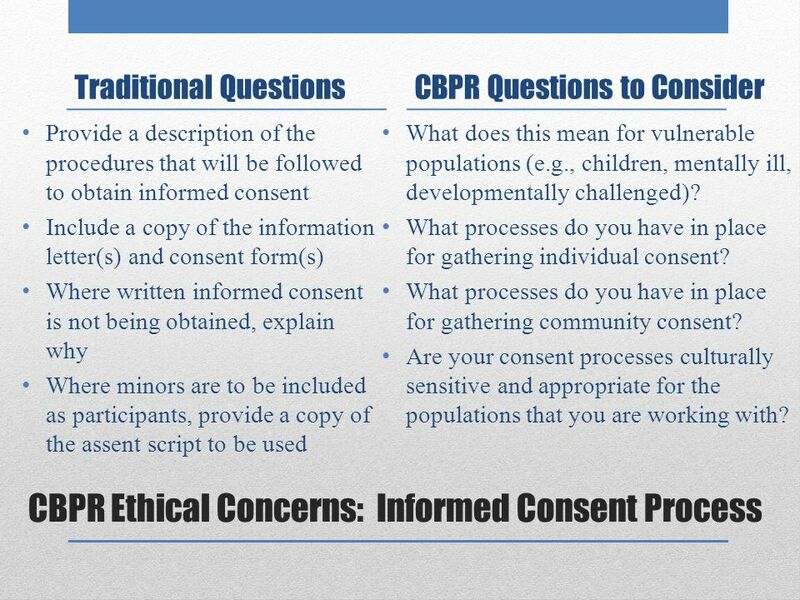 19 CBPR Ethical Concerns: Informed Consent Process Traditional Questions Provide a description of the procedures that will be followed to obtain informed consent Include a copy of the information letter(s) and consent form(s) Where written informed consent is not being obtained, explain why Where minors are to be included as participants, provide a copy of the assent script to be used CBPR Questions to Consider What does this mean for vulnerable populations (e.g., children, mentally ill, developmentally challenged)? What processes do you have in place for gathering individual consent? What processes do you have in place for gathering community consent? 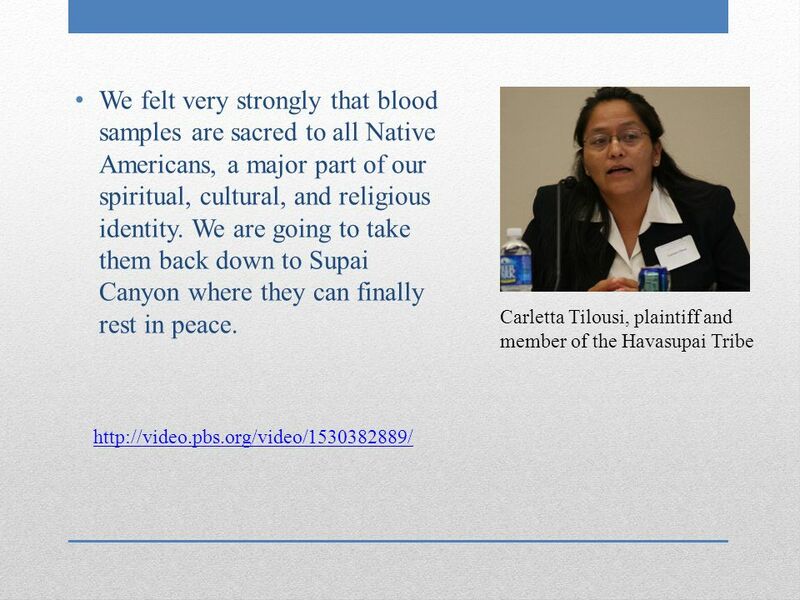 Are your consent processes culturally sensitive and appropriate for the populations that you are working with? 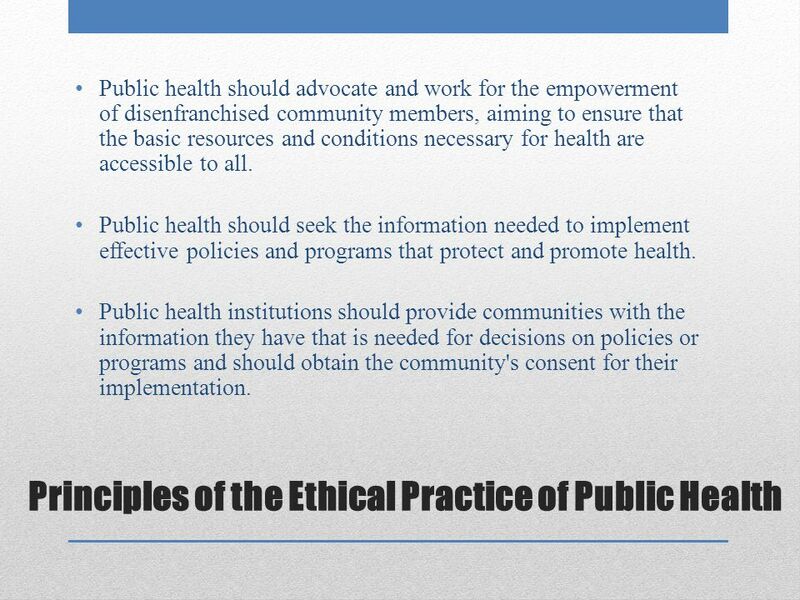 23 Principles of the Ethical Practice of Public Health Public health should address principally the fundamental causes of disease and requirements for health, aiming to prevent adverse health outcomes. Public health should achieve community health in a way that respects the rights of individuals in the community. 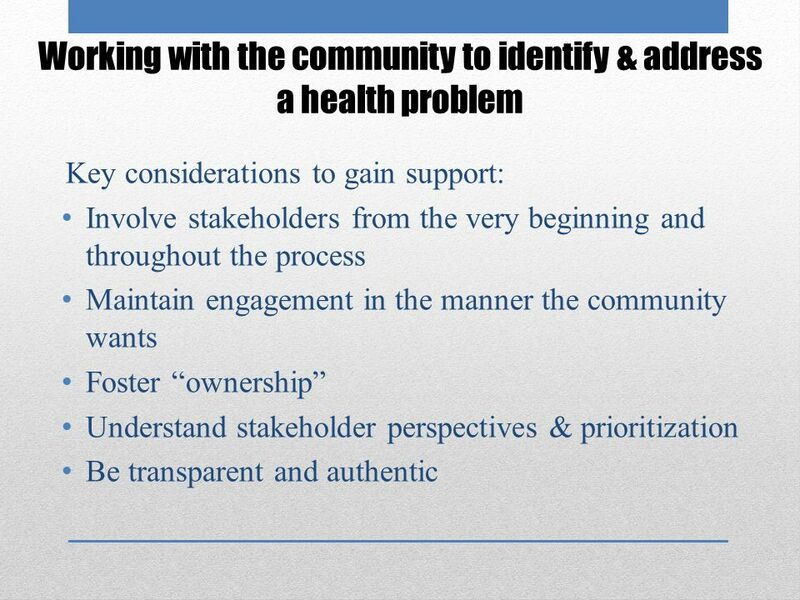 Public health policies, programs, and priorities should be developed and evaluated through processes that ensure an opportunity for input from community members. 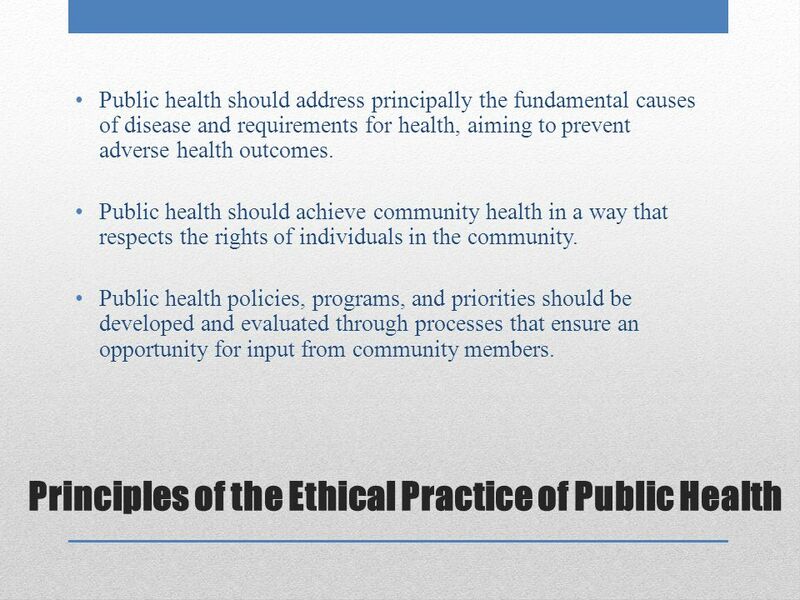 24 Principles of the Ethical Practice of Public Health Public health should advocate and work for the empowerment of disenfranchised community members, aiming to ensure that the basic resources and conditions necessary for health are accessible to all. Public health should seek the information needed to implement effective policies and programs that protect and promote health. 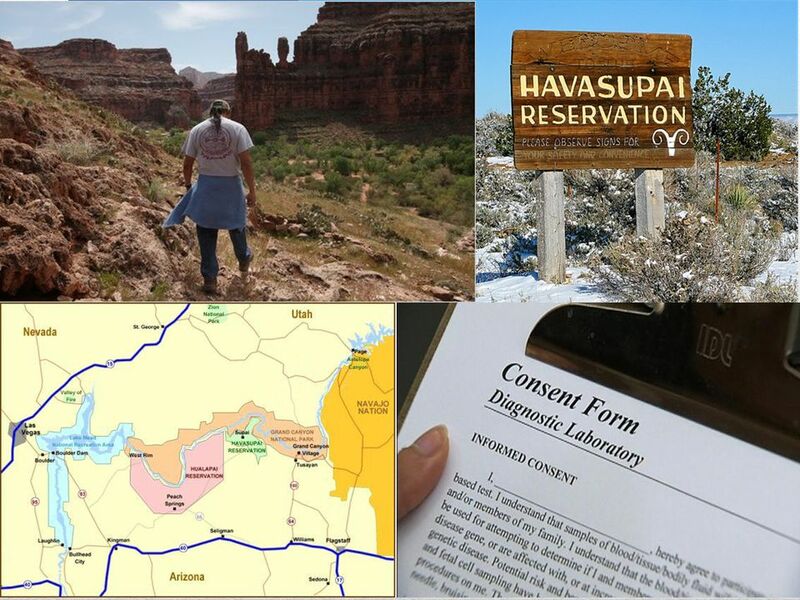 Public health institutions should provide communities with the information they have that is needed for decisions on policies or programs and should obtain the community's consent for their implementation. 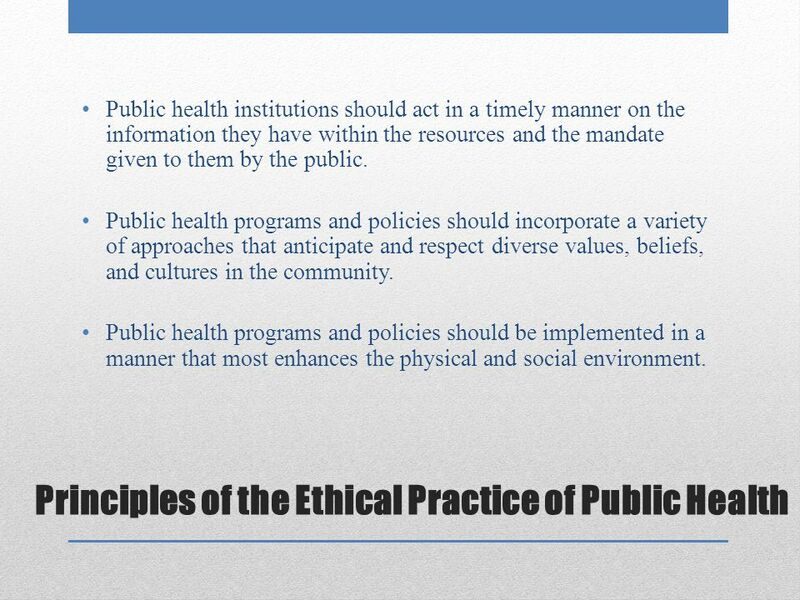 25 Principles of the Ethical Practice of Public Health Public health institutions should act in a timely manner on the information they have within the resources and the mandate given to them by the public. 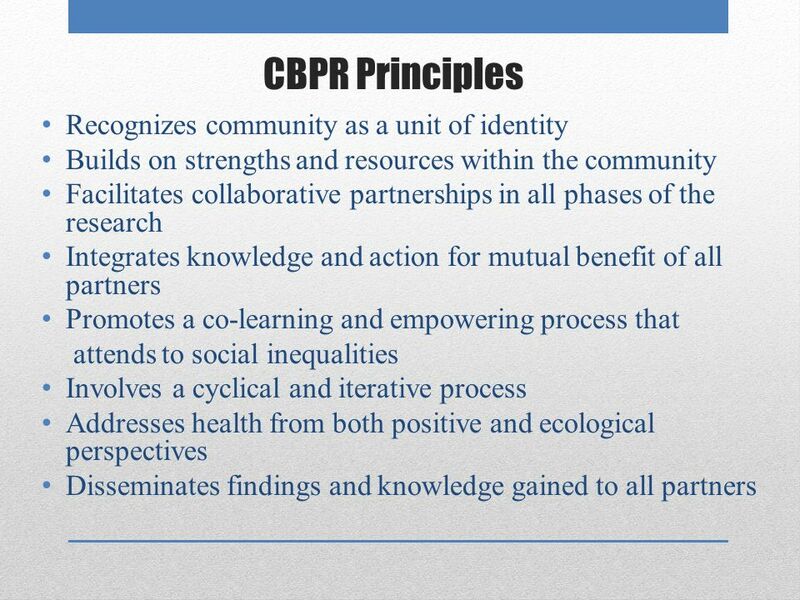 Public health programs and policies should incorporate a variety of approaches that anticipate and respect diverse values, beliefs, and cultures in the community. Public health programs and policies should be implemented in a manner that most enhances the physical and social environment. 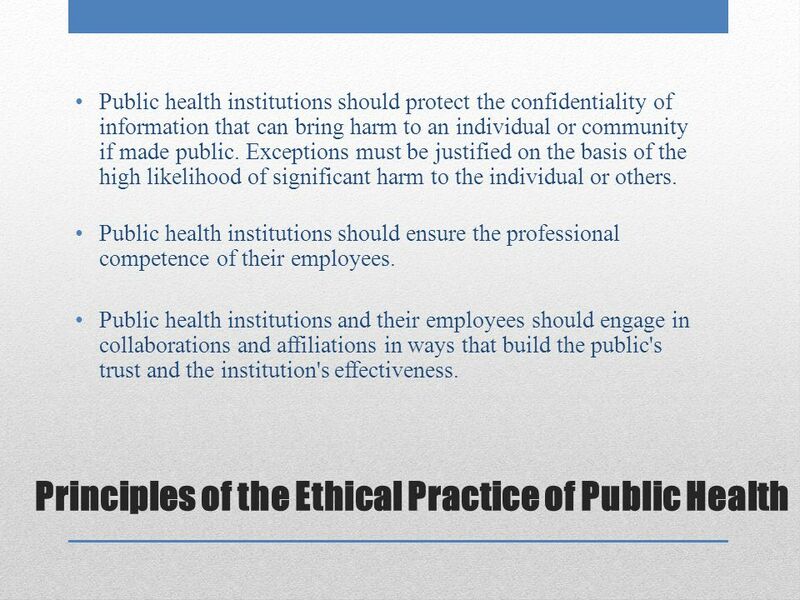 26 Principles of the Ethical Practice of Public Health Public health institutions should protect the confidentiality of information that can bring harm to an individual or community if made public. Exceptions must be justified on the basis of the high likelihood of significant harm to the individual or others. Public health institutions should ensure the professional competence of their employees. Public health institutions and their employees should engage in collaborations and affiliations in ways that build the public's trust and the institution's effectiveness. 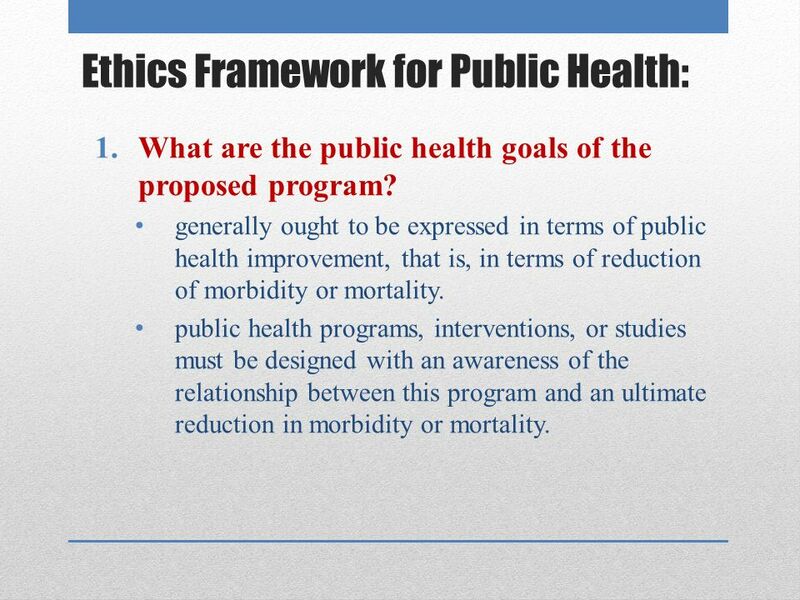 28 Ethics Framework for Public Health: 1.What are the public health goals of the proposed program? generally ought to be expressed in terms of public health improvement, that is, in terms of reduction of morbidity or mortality. public health programs, interventions, or studies must be designed with an awareness of the relationship between this program and an ultimate reduction in morbidity or mortality. 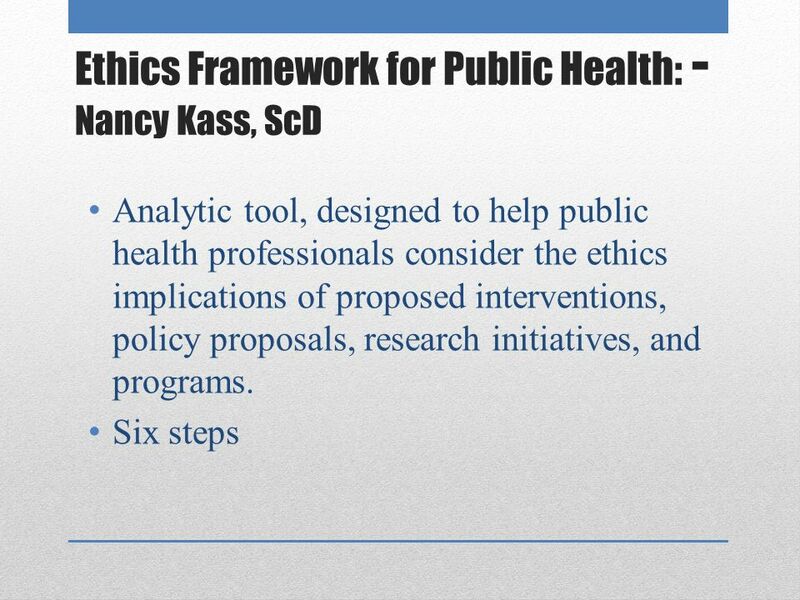 29 Ethics Framework for Public Health: 2.How effective is the program in achieving its stated goals? a program ultimately cannot claim success if behavior is unaffected and morbidity and mortality rates remain unchanged; that is, increasing knowledge/awareness is not enough. 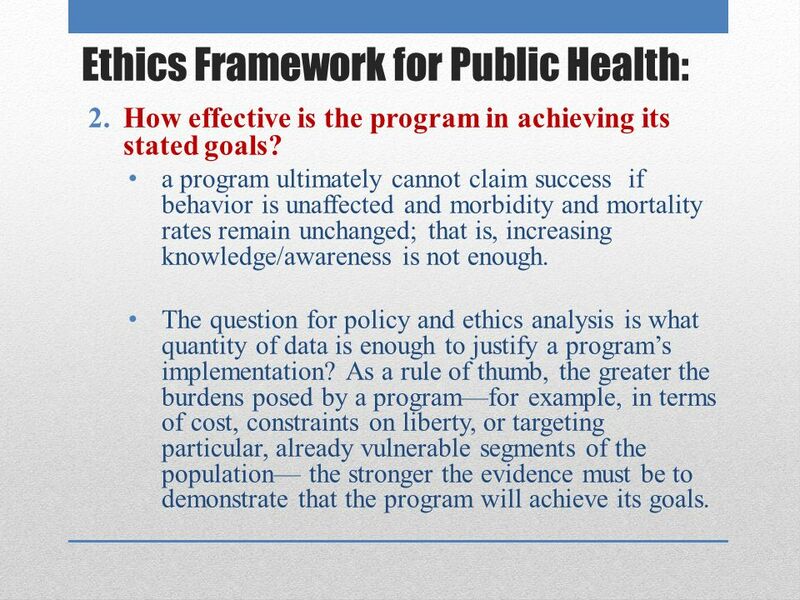 The question for policy and ethics analysis is what quantity of data is enough to justify a program’s implementation? As a rule of thumb, the greater the burdens posed by a program—for example, in terms of cost, constraints on liberty, or targeting particular, already vulnerable segments of the population— the stronger the evidence must be to demonstrate that the program will achieve its goals. 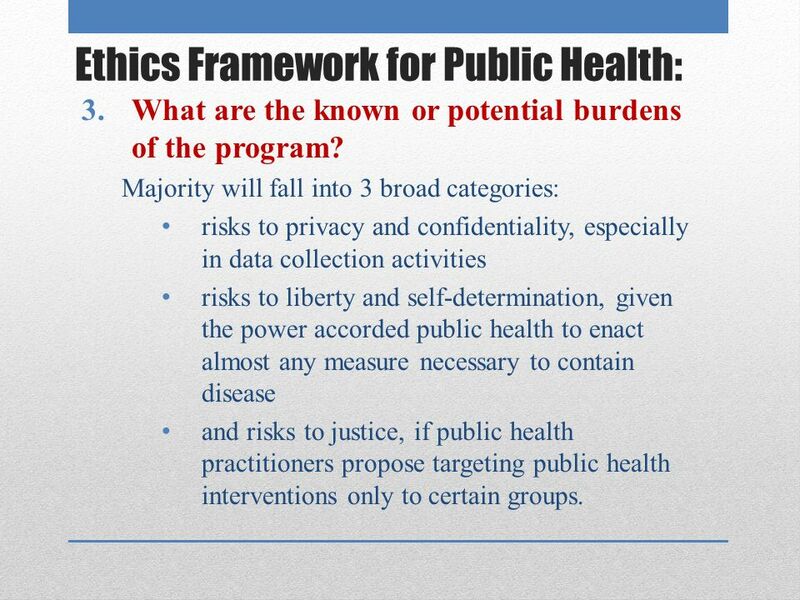 30 Ethics Framework for Public Health: 3.What are the known or potential burdens of the program? 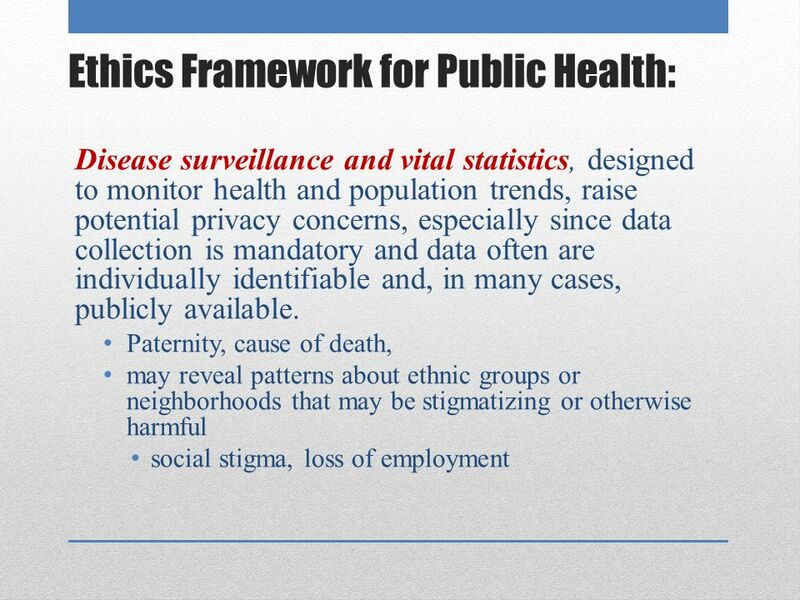 Majority will fall into 3 broad categories: risks to privacy and confidentiality, especially in data collection activities risks to liberty and self-determination, given the power accorded public health to enact almost any measure necessary to contain disease and risks to justice, if public health practitioners propose targeting public health interventions only to certain groups. 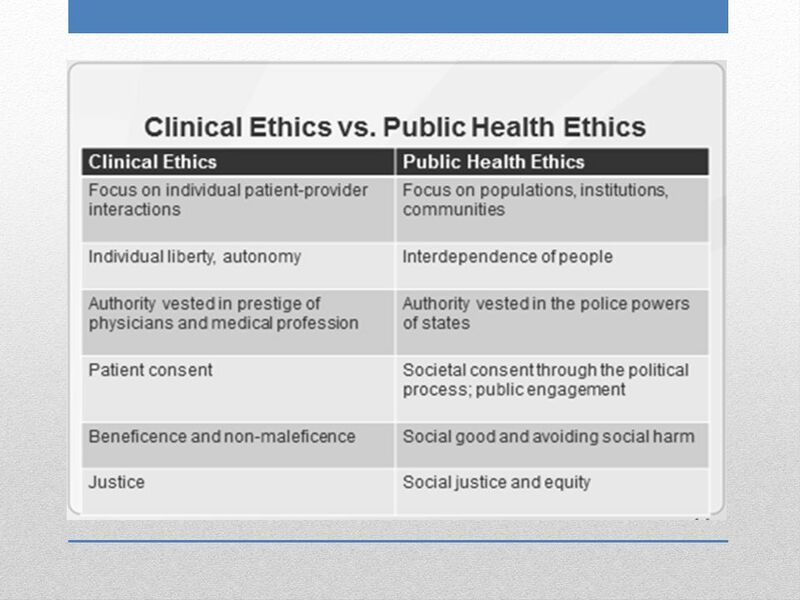 32 Ethics Framework for Public Health: Health education poses interesting questions in terms of ethics. to increase effectiveness, educational programs may introduce ethically questionable practices, such as manipulation or even coercion (providing only partial or even false information to achieve its ends; financial incentives) health education campaigns are potentially paternalistic, suggesting that certain ways of being (e.g., in greater aerobic health) are universally valued Social and public health ramifications of targeting must be seriously considered (STDs). 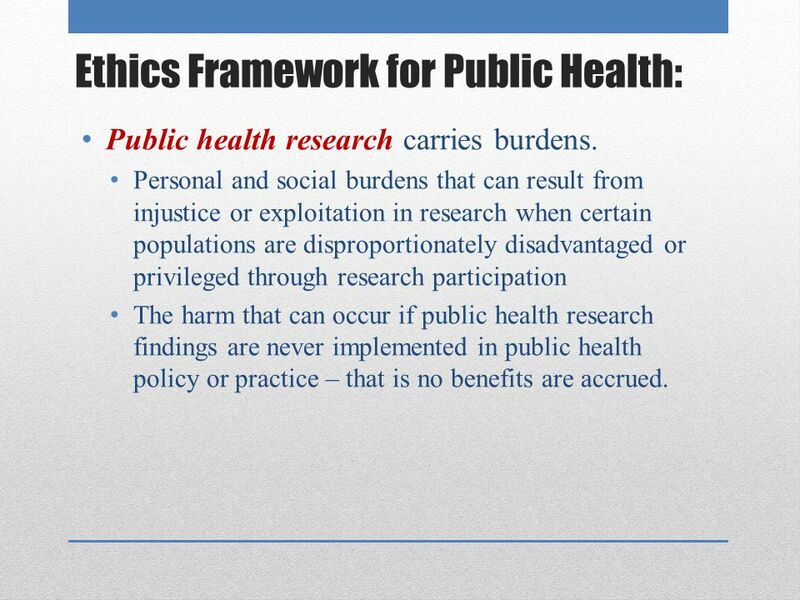 33 Ethics Framework for Public Health: Public health research carries burdens. Personal and social burdens that can result from injustice or exploitation in research when certain populations are disproportionately disadvantaged or privileged through research participation The harm that can occur if public health research findings are never implemented in public health policy or practice – that is no benefits are accrued. 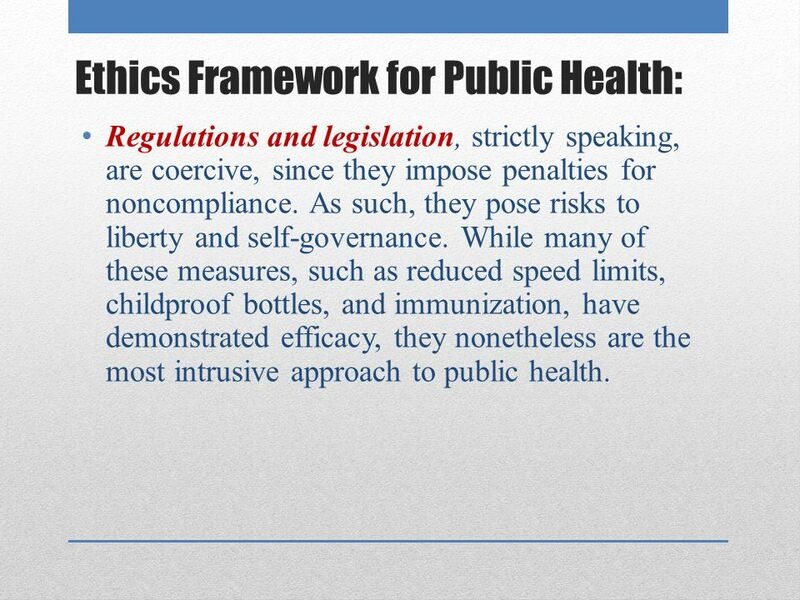 34 Ethics Framework for Public Health: Regulations and legislation, strictly speaking, are coercive, since they impose penalties for noncompliance. As such, they pose risks to liberty and self-governance. While many of these measures, such as reduced speed limits, childproof bottles, and immunization, have demonstrated efficacy, they nonetheless are the most intrusive approach to public health. 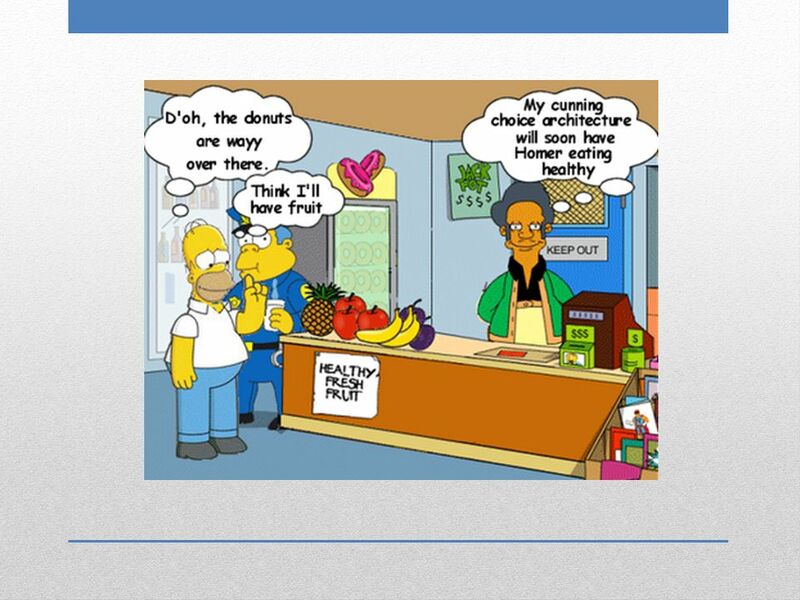 35 Ethics Framework for Public Health: 4.Can burdens be minimized? Are there alternative approaches? We are ethically required to determine whether the program could be modified in ways that minimize the burdens while not greatly reducing the program’s efficacy. 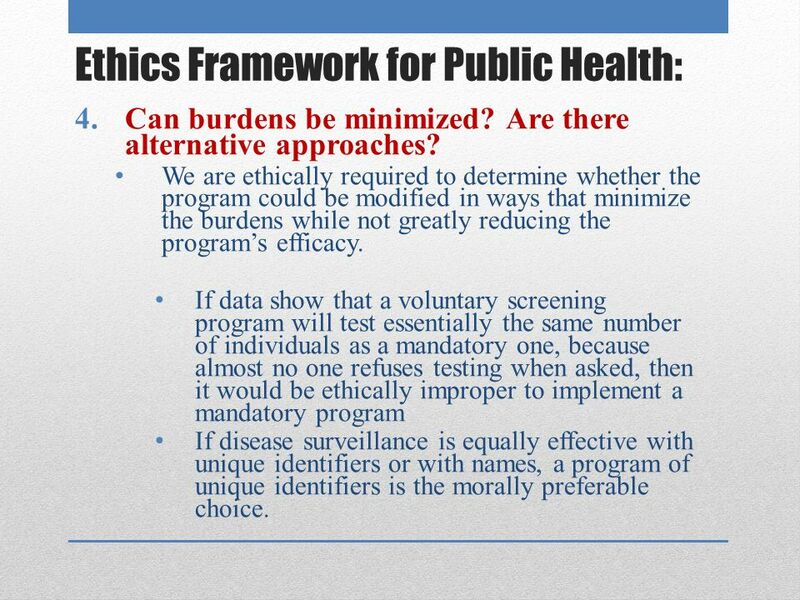 If data show that a voluntary screening program will test essentially the same number of individuals as a mandatory one, because almost no one refuses testing when asked, then it would be ethically improper to implement a mandatory program If disease surveillance is equally effective with unique identifiers or with names, a program of unique identifiers is the morally preferable choice. 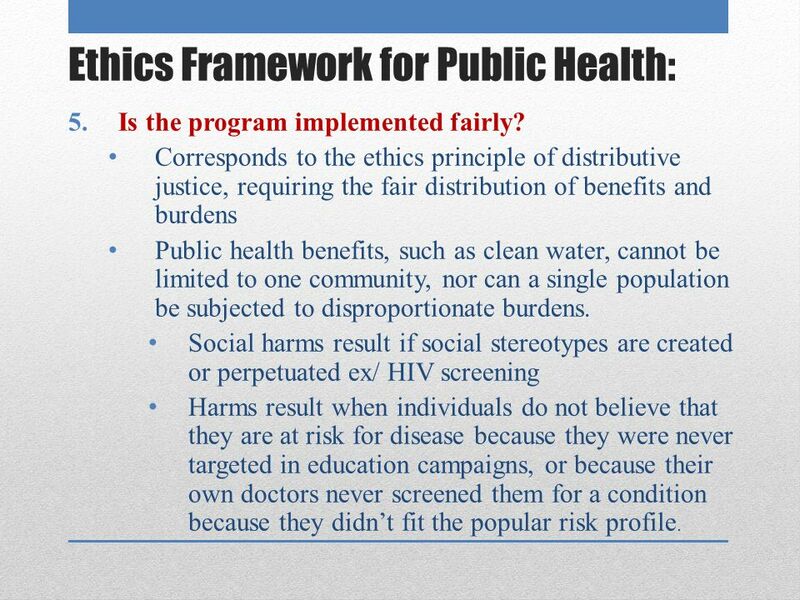 36 Ethics Framework for Public Health: 5.Is the program implemented fairly? Corresponds to the ethics principle of distributive justice, requiring the fair distribution of benefits and burdens Public health benefits, such as clean water, cannot be limited to one community, nor can a single population be subjected to disproportionate burdens. Social harms result if social stereotypes are created or perpetuated ex/ HIV screening Harms result when individuals do not believe that they are at risk for disease because they were never targeted in education campaigns, or because their own doctors never screened them for a condition because they didn’t fit the popular risk profile. 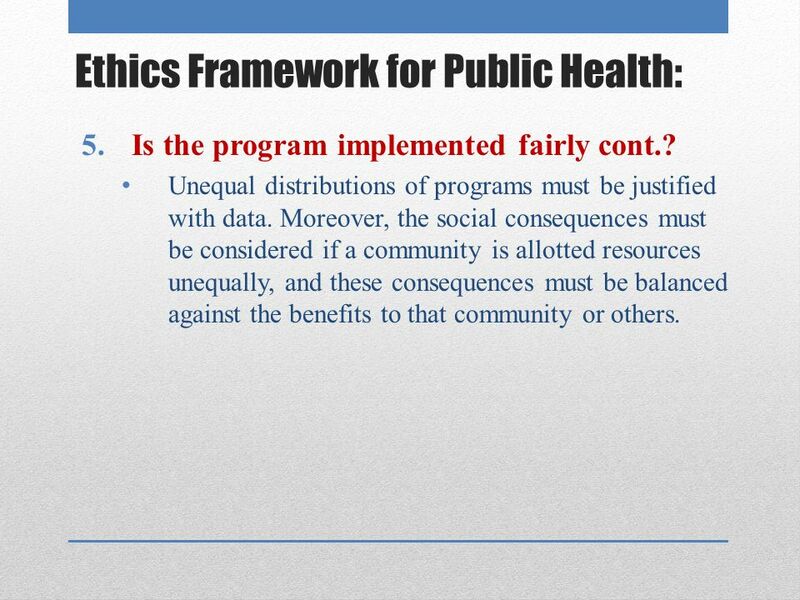 37 Ethics Framework for Public Health: 5.Is the program implemented fairly cont.? Unequal distributions of programs must be justified with data. Moreover, the social consequences must be considered if a community is allotted resources unequally, and these consequences must be balanced against the benefits to that community or others. 38 Ethics Framework for Public Health: Does public health have any explicit role in righting existing injustices, especially given the strong link between poor living conditions and poor health outcomes. 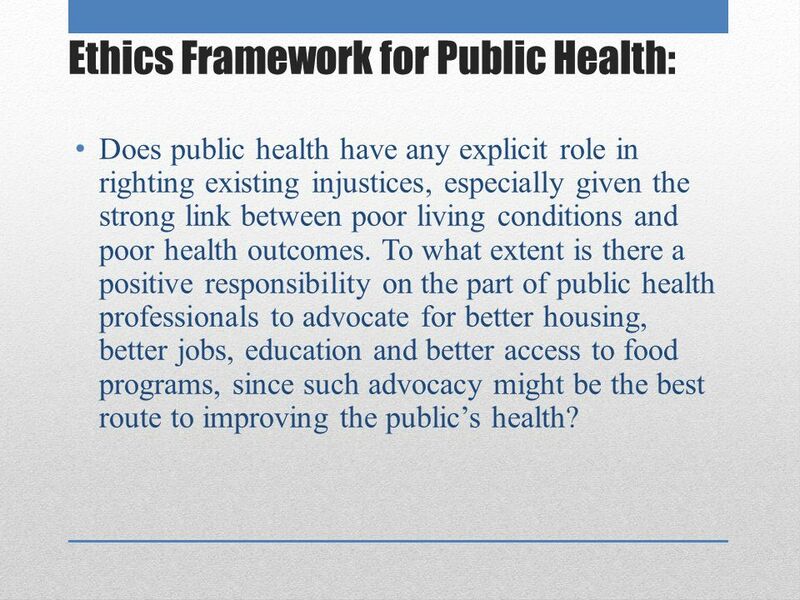 To what extent is there a positive responsibility on the part of public health professionals to advocate for better housing, better jobs, education and better access to food programs, since such advocacy might be the best route to improving the public’s health? 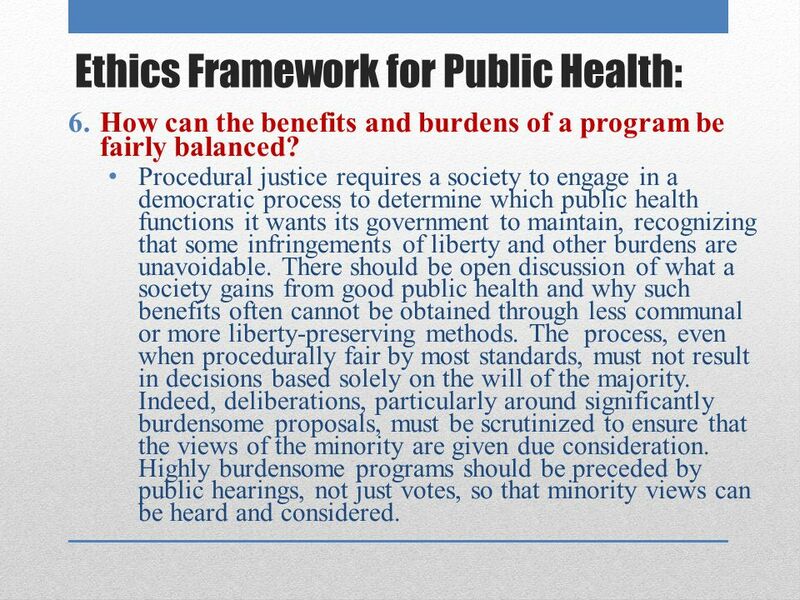 39 Ethics Framework for Public Health: 6.How can the benefits and burdens of a program be fairly balanced? Procedural justice requires a society to engage in a democratic process to determine which public health functions it wants its government to maintain, recognizing that some infringements of liberty and other burdens are unavoidable. There should be open discussion of what a society gains from good public health and why such benefits often cannot be obtained through less communal or more liberty-preserving methods. The process, even when procedurally fair by most standards, must not result in decisions based solely on the will of the majority. Indeed, deliberations, particularly around significantly burdensome proposals, must be scrutinized to ensure that the views of the minority are given due consideration. Highly burdensome programs should be preceded by public hearings, not just votes, so that minority views can be heard and considered. 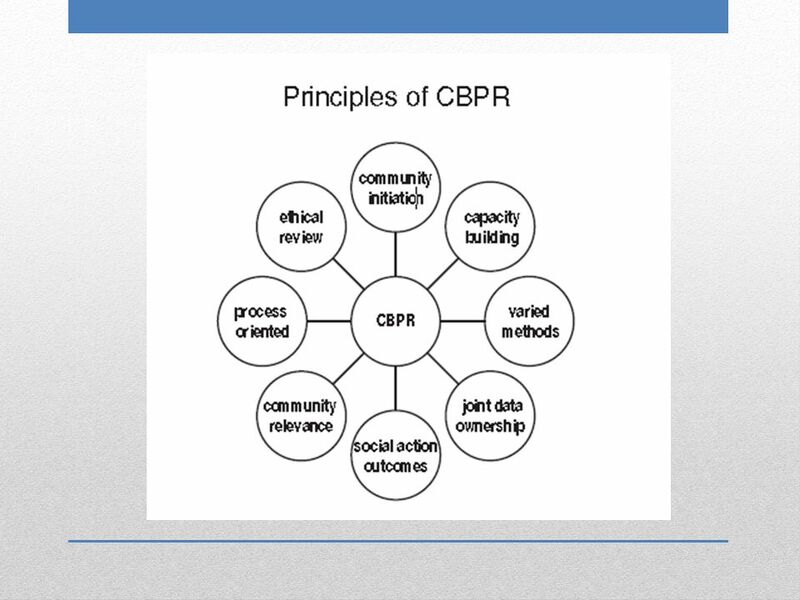 Download ppt "VOICE OF THE STAKEHOLDERS: PRINCIPLES OF COMMUNITY-BASED PARTICIPATORY RESEARCH." Working Together: Tips for Creating Successful Community-Academic Partnerships Leah Alexander, Ph.D. April 23, 2009. University Research Ethics Committee Workshop on procedure and data protection issues 30th May 2008. 1 Questions on Ethical Responsibilities in STD Research in Resource-Limited Settings Personal Perspectives Salaam Semaan 1, DrPH and Kate MacQueen 2, PhD. Clinical Examination and Procedural Skills The assessment of psychomotor skills in WPBA for the MRCGP examination. Use of Children as Research Subjects What information should be provided for an FP7 ethical review?